The method of plank cooking starts with the Native Americans of the Northwest who would put whole salmon on large cedar planks and place it over a fire. The plank held the fish together and let it roast over the fire while the cedar plank smoldered and flavored the fish with smoke. This process of grilling fish has become popular and several companies manufacture planks specifically for this purpose. What most people don't realize is that you can do so much more with a plank than grill salmon. 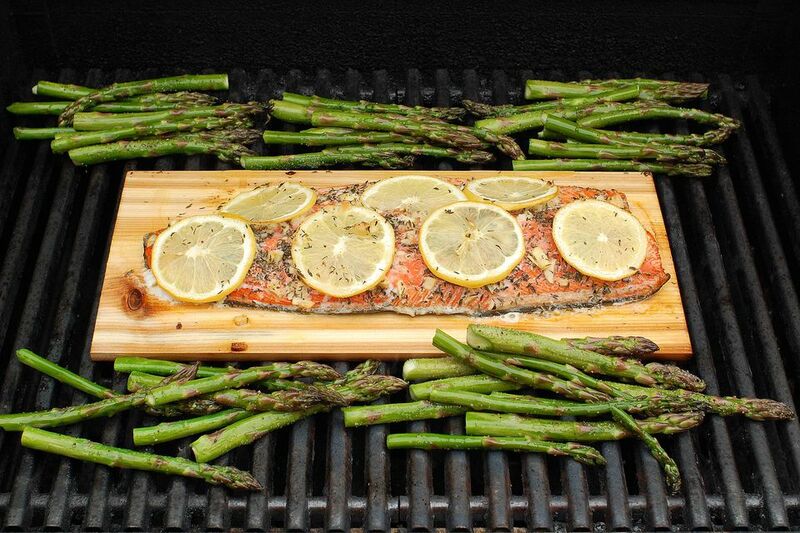 Of course, the plank grilling method is perfect for any delicate item like fish or seafood. It provides a stable platform and you don't have to worry about flipping a large fillet over on the grill only to have it fall apart and disappear through the cooking grate. However, plank grilling is perfect for any meat on the grill including, chicken and steaks. Since it is easier to pick up and move more delicate food items, the planks provide extra opportunities when grilling. The article Fish on a Plank has more detailed information, but the basic process is to take a wood plank–cedar, alder, oak, cherry, or any other kind of smoking wood–that is bigger by an inch all around than the fish you want to grill. Thicker planks are good and use one least 1/2 inch thick. Soak the plank submerged in water for an hour. Remove from the water and allow to drain. The plank should be damp through the middle, but not dripping wet. Place the fish on the plank and season. You can cover the fish with salt and pepper, garlic, and thin lemon slices. Put the whole thing in a medium hot grill and cook until the fish flakes nicely and is completely cooked through. This method keeps the fish together and moist. When the fish is done, remove the whole plank from the grill and place on a large sheet of aluminum foil. Fold up the foil so that it stays with the plank and put the whole thing in the center of the table. Fish will remain on the plank the whole time, but if you are grilling something else, like steaks, chicken, scallops and shrimp, lamb, or pork, you can lift these items up and move them around easily. This allows for versatility that you can now take advantage of. Just like before, the plank gets soaked in water and allowed to drip until damp. Prepare your food, but before it goes on the plank, put the board on the grill over high heat for about five minutes or until the underside of the plank starts to smolder. Flip the plank over and put the food on the slightly charred side of the board. This means putting the food on a hot surface. This gives more texture to the surface of meats and transfers heat as well as dries the surface that the food goes on to improve roasting and reduce steaming. There are other advantages to plank grilling. Placing a damp plank on the grill is going to produce smoke while proving a space to park foods for indirect grilling. This means high-temperature searing before some slow, smoky roasting. Now, the real advantage is that grilling on a plank can reach a whole new level. Place plank on grill, put the food (steaks, chops, scallops, etc.) on the grill, sear, move to plank, top with sauce (chimichurri, barbecue, etc.) and continue grilling until done. Now, similar to the fish, remove the whole plank from the grill, put on a sheet of foil (so you don't get the tablecloth dirty), and serve. So next time you see those planks piled up at the store think about this, you can do so much more than grill a salmon.